Despite government claims to the contrary, many in China's countryside continue to lack access to modern health care. China’s top health authority announced Friday that 99 percent of rural Chinese, or 800 million individuals, are now covered by the country’s New Rural Cooperative Medical Scheme (NCMS). Ten years ago, in 2003, just 8 million rural Chinese had health insurance. By 2005 that number had jumped to 179 million, and in less than ten years, according to official statistics, China has attained near universal coverage in rural areas. By 2010, 93 percent of the population was covered by some form of health insurance. The lower number of urban residents covered (65 percent) reflects some of the difficulties in tracking rural-to-urban migrants. From 1950 to the early 1980s, China’s rural health scheme depended mainly on Mao Zedong’s “barefoot doctors” and a remarkable public health network that was almost exclusively government funded and run. Rural health care coverage reached almost 90 percent during this time. This was brought to a halt after the economic reforms of the late 1970s, when healthcare as a state-owned enterprise was transformed and privatized. Rural health insurance programs ceased operating, and urban schemes floundered under the crippling cost of health care and the inefficiency of state-run hospitals. As the number of healthcare workers in the countryside plummeted in the wake of the reforms, the cost of medicine soared. Soon, pharmacies were closing, and by the late 1980s the rural healthcare system had all but collapsed, draining the countryside of quality healthcare workers. Public dissatisfaction grew as health care costs continued to rise sharply and quality service became increasingly unaffordable. This scrutiny came to a head during the SARS outbreak in 2003, during which the public decried a system that provided little preventative and emergency care. Over the course of the next decade, the government rolled out one of the most extensive health care coverage systems in history. 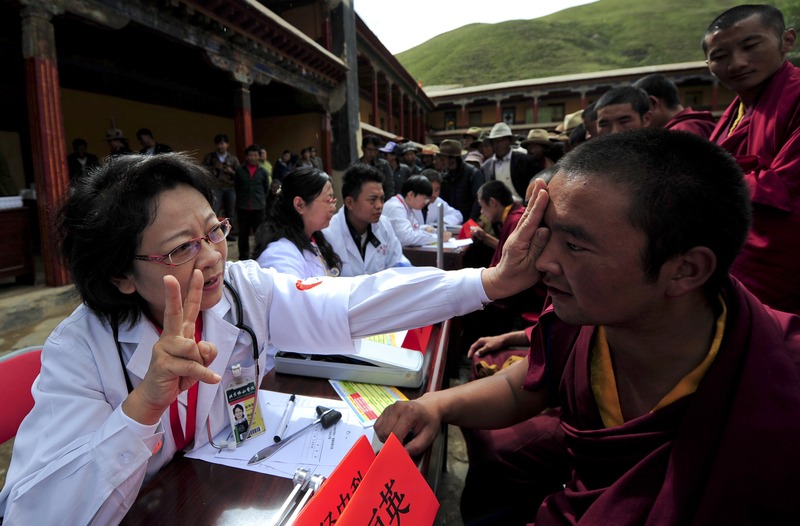 In 2009 China unveiled its blueprint for health reform, guaranteeing that in three years its goal of universal coverage would be met. Authorities committed 850 billion RMB (about US $126 billion) to the “four beams” of reform: public health care, medical care, essential drugs and health insurance (including the Rural Cooperative Medical Scheme, the Urban Employee-based Basic Medical Insurance Scheme and the Urban Resident-Based Basic Medical Insurance Scheme). Because the rural health insurance program runs primarily on public funds, it is not able to provide generous drug reimbursement. Co-payments are still high and financial risk protection is limited, although there is a medical financial assistance program that targets people living below the poverty line. 1) Improve the facilities of rural health institutions. Many rural hospitals and clinics have been newly established during the last 4 years. 2) Increase subsidies for the rural health insurance premium and increase the reimbursement rates. The premium in 2003 was only 30 RMB per person, with 20 RMB from the government. Now the subsidy from the government is at least 240 RMB. The more the area is developed, the higher the government subsidy. 3) Combine rural and urban health insurance. Now 6 provinces, 40 prefectures, and 160 counties have a single health insurance for rural people and urban citizens. 4) Reform public hospitals to control costs. China is a huge country with very different levels of economic and social development, and determinants of health often lie outside the health sector. Local governments are the ones primarily responsible for health reform, which becomes problematic as they are often more focused on building economic infrastructure. In these cases, healthcare may not be a priority, although Dr. Chen is optimistic for change as the “health performance” indicator of local officials is often evaluated by the local NCMS participation rate. Lua Wilkinson, a PhD candidate in Nutrition at Cornell University, is a contributor to Tea Leaf Nation.